The parish of North Runcton lies in western Norfolk about 3 miles southeast of the port of King's Lynn. North Runcton is a small and compact village centred on a pleasant village green just south of the A47 and east of the A10 and close to their busy junction. In contrast to these busy roads North Runcton is a relative haven of peace. This attractive location was clearly a draw for the wealthier citizens of King's Lynn as there appears a higher than normal number of baptisms to the elite of the local society within this transcript. Prominent among these are the Gurney family, at Runcton Hall (since demolished), of banking fame. The less wealthy would as in most Norfolk communities have earned a living at agriculture. Today the village is a much sought after commuter settlement albeit not spoilt by modern developments and retaining the village character. All Saints church sits on the northern side of North Runcton's extensive village green. 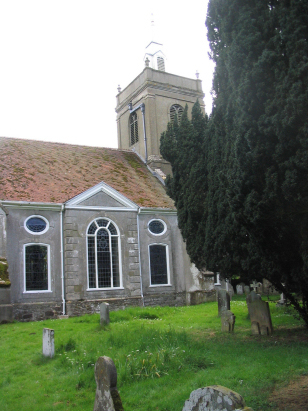 The church is a rarity in Norfolk being of the 18th century. This was, however, not some brutal replacement of an aging mediaeval building by a local big-wig but necessitated by the partial destruction of the original church when the tower collapsed in 1701. 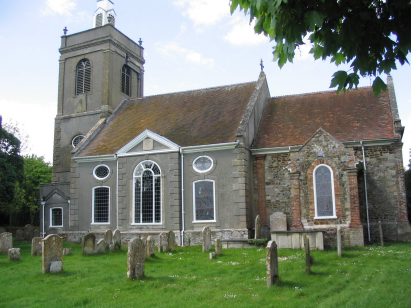 Funded by North Runcton's wealthy community today's church rose from the ruin church's site between 1703 and 1713. The design by local architect Henry Bell shows features which had been perfected by Wren during the City of London's rebuild following the Great Fire and the building clearly fascinates Pevsner as he describes, at length, its features. There is much use of the local carstone with exposed areas a feature especially in the chancel. After the original build there were a few additions, the Gurney vault in 1837 and an extension for the organ in 1894. The church is accessed by a driveway crossing the green and sits within an enclosing flint wall, there are quite a few trees around which somewhat limit the angles for photography. Two standard 800-entry register books cover the period of this transcript. The first running from 1813 to 1876 in filmed on Microfiche 6 & 7, the second which runs onward to the late 20th century is on fiche 12, all in the collection of Norfolk Record Office. Online images at Familysearch were, however, used in the place of these fiche as the images were rather poor in quality being slightly overexposed and lacking the crisp contrast available in today's films. The images online were also rather wishy-washy but adequate to the task despite some often poor clerical work, gaps in the numbering are caused by the clerks starting a new page for each year for part of the period.